SATB2 is a risk locus for schizophrenia and encodes a DNA-binding protein that regulates higher-order chromatin configuration. In the adult brain Satb2 is almost exclusively expressed in pyramidal neurons of two brain regions important for memory formation, the cerebral cortex and the CA1-hippocampal field. Here we show that Satb2 is required for key hippocampal functions since deletion of Satb2 from the adult mouse forebrain prevents the stabilization of synaptic long-term potentiation and markedly impairs long-term fear and object discrimination memory. At the molecular level, we find that synaptic activity and BDNF up-regulate Satb2, which itself binds to the promoters of coding and non-coding genes. Satb2 controls the hippocampal levels of a large cohort of miRNAs, many of which are implicated in synaptic plasticity and memory formation. Together, our findings demonstrate that Satb2 is critically involved in long-term plasticity processes in the adult forebrain that underlie the consolidation and stabilization of context-linked memory. Satb2 is a transcriptional regulator that binds to matrix attachment regions in the DNA and recruits chromatin-modifying complexes at the anchorage sites (Baranek et al., 2012; Britanova et al., 2005; Gyorgy et al., 2008; Szemes et al., 2006). Furthermore, similarly to its homologue Satb1 (Wang et al., 2014, 2012), Satb2 modifies higher-order chromatin structure by mediating the formation of intra-chromosomal DNA loops (Zhou et al., 2012). Recent genome-wide association studies of schizophrenia have identified SATB2 as a genetic risk locus (Schizophrenia Working Group of the Psychiatric Genomics Consortium, 2014). Moreover, patients with mutations or deletions within the SATB2 locus, a condition referred to as ‘SATB2-associated syndrome (SAS)’, exhibit severe learning difficulties and profound mental retardation, providing further indication for a potential role of SATB2 in higher brain function (Liedén et al., 2014; Zarate et al., 2015; Zarate and Fish, 2016; Marshall et al., 2008). So far the neuropsychiatric symptoms of SAS have been discussed in the context of the established role of Satb2 during embryonic development of the cerebral cortex. In the embryonic cortex Satb2 is restricted to upper layer neurons where it inhibits the corticospinal motor neuron fate and promotes callosal neuron identity (Alcamo et al., 2008; Britanova et al., 2008; Leone et al., 2015; Srinivasan et al., 2012; Srivatsa et al., 2014). Thus, deficits in cortico-cortical connections could account for the reported neurological defects in SAS patients. However, patients with SATB2 haploinsufficiency have no apparent corpus callosum abnormalities (Lee et al., 2015; Rosenfeld et al., 2009). In heterozygous Satb2 knockout mice, resembling the genetic condition of SAS patients, the corpus callosum is also intact (Alcamo et al., 2008). This suggests a function of Satb2 in adult brain independent from its developmental role. The function of Satb2 in the adult central nervous system (CNS) is completely unknown since germ-line Satb2-deficient mice die perinatally (Dobreva et al., 2006). In contrast to the layer-specific embryonic expression, adult CNS Satb2 is expressed in pyramidal neurons of all layers of the cerebral cortex and in the hippocampal CA1 area (Huang et al., 2013). As both brain regions are tightly linked to cognition, Satb2 is well-positioned to regulate cognitive processes. In this study, we investigated the role of Satb2 in the mature mouse brain by selectively deleting Satb2 from forebrain excitatory neurons after the third postnatal week. Our results demonstrate deficient long-term potentiation (LTP) and long-term memory in Satb2 conditional mutants. At a mechanistic level, we establish Satb2 as a nuclear component of two main pathways implicated not only in cognition but also in schizophrenia pathophysiology, i.e. BDNF signaling and miRNA-mediated post-transcriptional regulation of gene expression. Given the highly specific expression pattern of Satb2 in the adult brain (Figure 1A) as well as the severe learning disabilities and mental retardation observed in SAS patients, we hypothesized that Satb2 is critical for learning and memory. To circumvent the perinatal and early postnatal lethality of the existing constitutive and conditional Satb2 mutants (Dobreva et al., 2003; Srinivasan et al., 2012) and to be able to perform behavioral experiments, we generated a novel conditional Satb2 mutant line by crossing mice bearing a floxed allele of Satb2 (Satb2flox/flox) with mice that express Cre recombinase under the Camk2a promoter (Minichiello et al., 1999). The expression of the Camk2a-Cre transgene allowed for a forebrain-specific deletion of Satb2 from the third postnatal week on, thus bypassing the confounding effects of early Satb2 inactivation on the formation of cortical neuronal circuits (Alcamo et al., 2008; Britanova et al., 2008; Harb et al., 2016; Leone et al., 2015; Srinivasan et al., 2012; Srivatsa et al., 2014). The absence of Satb2 protein in the cortex and hippocampus of adult but not juvenile Satb2flox/flox::Camk2a-Cre mice (Satb2 cKO) was confirmed by immunoblotting (Figure 1B) and immunohistochemistry (Figure 1C, Figure 1—figure supplement 1). Satb2 cKO mice were viable, fertile, and reached the same age and body weights as their littermate controls (Figure 1—figure supplement 2A). Gross morphological examination revealed no abnormalities in the brain of Satb2 cKO mutants (Figure 1—figure supplement 2B). Corpus callosum and the cellular layers of the neocortex and hippocampus appeared intact (Figure 1D). Immunoreactivity for the CA1-specific marker Wfs1 (Figure 1E) and the cortical layer markers Cux1, Ctip2, Tbr1 (Figure 1—figure supplement 2C) was undistinguishable from control mice, suggesting normal cortical and hippocampal morphology in Satb2 conditional mutants. Characterization of Satb2 conditional mutants. (A) Satb2 is mainly expressed in the adult forebrain. Immunostaining for Satb2 of sagittal brain sections from adult mice. Scale bar: 1000 μm. (B) Immunobloting analysis of the Satb2 protein level in cortical or hippocampal lysates from adult Satb2 cKO mice (cKO) or Satb2flox/flox mice (Ctrl). Erk2 was used as loading control. Representative images are shown. (C) Satb2 immunostaining of coronal brain sections from 3-month old Satb2 cKO mice or Satb2flox/flox littermate controls. Nuclei were counterstained with DAPI. Representative images are shown. Scale bar: 200 μm. (D) Nissl-stained coronal brain sections from 3-month old Satb2 cKO mice and littermate controls, demonstrating normal gross brain morphology of Satb2 cKO animals. Scale bar: 200 μm. High magnification views of boxed areas reveal the normal cyto-architecture of the cortex and hippocampus of Satb2 cKO mice. Representative images are shown. Scale bar: 50 μm. (E) Immunohistochemical labeling against the CA1 specific marker Wfs1 in hippocampus of Satb2 cKO mice and littermate controls reveals normally developed hippocampal CA1 area in Satb2 mutants. Nuclei were counterstained with DAPI. Representative images are shown. Scale bar: 150 μm. To test whether Satb2 is required for learning and memory we used contextual fear conditioning, a hippocampus-dependent paradigm of associative learning. Satb2 cKO mice showed a normal response to electric foot shock exposure (Figure 2—figure supplement 1) and normal fear acquisition during fear conditioning (Figure 2A). Short-term memory for contextual fear, measured 1 hr following training, was also not affected in Satb2 cKO mice. However, Satb2 cKO mice exhibited a significant decrease in freezing when compared to control littermates 24 hr after training (Figure 2A), indicating a specific deficit in the consolidation of associative memory. Next, we subjected Satb2 conditional mutants to the object location memory (OLM) and novel object recognition memory (ORM) tasks. Again, Satb2 cKO mice demonstrated normal short-term (1 hr) memory but significant deficits in long-term (24 hr) OLM (Figure 2B) and ORM (Figure 2C), providing evidence for requirement of Satb2 for long-term object discrimination/placement memories. Satb2 is required for long-term memory formation. (A) In a contextual fear conditioning paradigm, Satb2 cKO mice (cKO), showed (i) similar levels of freezing to Satb2flox/flox mice (Ctrl) during the fear-acquisition phase (cKO, n = 7; Ctrl, n = 6; repeated measures ANOVA, F3,33 = 0.76, p = 0.52) and at the 1 hr fear expression test (Student's t test, t11 = 0.19, p = 0.86) but (ii) froze significantly less than their littermate controls at the 24 hr fear expression test (cKO, n = 8; Ctrl, n = 8; repeated measures ANOVA, F3,42 = 0.36, p = 0.778; Student's t test, t14 = 4.88, p = 0.0002). Data are presented as mean ± SEM, n values refer to the number of mice per group, *p < 0.05. (B) Object location memory test. (i) Scheme of the experiment. (ii) Satb2 cKO mice (n = 11) and control mice (n = 10) exhibited similar preference for the novel location over the familiar location at the 1 hr memory retention test (Student's t test, t19 = 0.46, p = 0.65). (iii) Satb2 cKO mice (n = 8) showed reduced preference for the novel location over the familiar location at the 24 hr memory retention test (Student's t test, t14 = 2.89, p = 0.011) compared to Satb2flox/flox mice (n = 8). The relative exploration time is expressed as a percent discrimination index (D.I. = (tnovel location − tfamiliar location) / (tnovel location + tfamiliar location) × 100%). Data are presented as mean ± SEM, n values refer to the number of mice, **p < 0.01. (C) Novel object recognition test. (i) Scheme of the experiment. (ii) Satb2 cKO mice (n = 10) and control mice (n = 9) exhibited a similar preference for the novel over the familiar object at the 1 hr memory retention test (Student's t test, t19 = 1.11, p = 0.28). (iii) Satb2 cKO mice (n = 8) spent less time exploring the novel object at the 24 hr memory retention test (Student's t test, t14 = 3.0, p = 0.009) compared to Satb2flox/flox mice (n = 8). The relative exploration time is expressed as a percent discrimination index (D.I. = (tnovel object− tfamiliar object) / (tnovel object+ tfamiliar object) × 100%). Data are presented as mean ± SEM, n values refer to the number of mice, *p < 0.05. Next, we investigated the effect of loss of Satb2 on long-term potentiation (LTP), an electrophysiological correlate of memory formation (Mayford et al., 2012). To this aim, we prepared acute slices from Satb2 cKO mice and littermate control animals and tested LTP at hippocampal Schaffer collateral-CA1 synapses. Field-excitatory post-synaptic potential recordings from the apical dendritic layer of the CA1 region showed that the early phase of LTP (up to 40 min post-theta burst stimulation) did not differ from control values; however late-LTP (45–180 min post-theta burst stimulation) was significantly attenuated in Satb2 cKO mice (Figure 3A). The slopes of the input-output curves (Figure 3B) and the paired-pulse facilitation ratios across different inter-pulse intervals (Figure 3C) did not differ between mutant and control mice indicating normal basal synaptic transmission and presynaptic function in Satb2 cKO mice. Hence, Satb2 is not required for short-term plasticity at CA3–CA1 synapses but is essential for late-LTP maintenance. Late-LTP maintenance is impaired in Satb2 conditional mutants. (A) Schaffer collateral-CA1 late-LTP was significantly impaired in Satb2 cKO mice (Student's t test, t28 = 4.92, p < 0.0001 for the interval 180–185 min post-theta burst stimulation, TBS). Shown are field EPSP slopes in Satb2flox/flox (Ctrl, n = 17 slices, 6 mice) vs. Satb2 cKO mice (cKO, n = 13 slices, 6 mice) recorded before and after TBS (100 Hz, repeated three times in a 10 s interval). Data are presented as mean ± SEM. (B) Input-output curves comparing the amplitudes of the presynaptic fiber volley to the field EPSP amplitude across a range of stimulation currents showed that basal synaptic transmission did not differ in hippocampal slices from Satb2 cKO mice (cKO, n = 17 slices, 6 mice) and littermate controls (Ctrl, n = 13 slices, 5 mice); Student's t test, p > 0.05 for all data points. Data are presented as mean ± SEM. (C) Paired-pulse facilitation studies across different inter-stimulus intervals revealed no difference between Satb2 cKO mice (cKO, n = 17 slices, 6 mice) and littermate controls (Ctrl, n = 13 slices, 5 mice); Student's t test, p > 0.05 for all data points. Data are presented as mean ± SEM. Given our findings of impaired hippocampal late-LTP in Satb2 conditional mutants, we examined whether neuronal activity or the neurotrophin BDNF, a mediator of structural and functional plasticity at synapses (Zagrebelsky and Korte, 2014), regulate Satb2 in primary hippocampal neurons. We treated hippocampal cultures with bicuculline (Bic) and 4-aminopyridine (4AP), a combination that causes robust action potential (AP) bursting (Hardingham et al., 2002). Bic/4AP application for 24 hr resulted in a strong up-regulation of both Satb2 mRNA (2.5-fold change, n = 7, Student's t test, p = 0.003) and protein levels (6.3-fold change, ANOVA, Ctrl vs. Bic/4AP, p = 0.002, Figure 4A). Next, we applied MK-801, a NMDA receptor antagonist, or nimodipine, an L-type VGCC blocker, together with Bic/4AP for 24 hr to determine which source of calcium (Bengtson et al., 2013) is required for Bic/4AP-triggered Satb2 induction. Nimodipine, but not MK-801, blocked the increase of Satb2 following synaptic activity indicating that Satb2 induction after synaptic stimulation depends on calcium influx through L-type VGCC and not through NMDA receptors (Figure 4A). Also BDNF and NT4, which both bind to the tyrosine kinase TrkB receptor, caused a significant increase in Satb2 mRNA (1.8-fold change, n = 7, Student's t test, p = 0.003) and protein (3-fold change, ANOVA, Ctrl vs. BDNF, p = 0.0004; Ctrl vs. NT4, p = 0.0002) levels 24 hr after treatment (Figure 4B). Synaptic activity and BDNF up-regulate Satb2 in primary hippocampal neurons. (A) Increased synaptic activity up-regulates Satb2 protein depending on calcium influx through L-type VGCC. Representative Western blot (top) and quantification (bottom) of the Satb2 protein level 24 hr after Bic/4AP treatment in the presence or absence of L-VGCC blocker nimodipine or NMDAR antagonist MK-801 (n = 10, 6, 7, 5; ANOVA followed by Hochberg post hoc test; F3,24 = 9.171, Ctrl vs. Bic/4AP, p = 0.002; Ctrl vs. Bic/4AP+MK-801, p = 0.006; Bic/4AP vs. Bic/4AP+Nim, p = 0.011). (B) BDNF and NT4 significantly increase Satb2 protein 24 hr after treatment. Representative Western blot image (top) and quantification of the Satb2 protein level (bottom) are shown, n = 4; ANOVA followed by Tukey post hoc test, F4,15 = 15.4, Ctrl vs. BDNF, p = 0.0004; Ctrl vs. NT4, p = 0.0002. (C) TTX application does not prevent Satb2 induction by BDNF but abolishes Satb2 up-regulation by synaptic activity. Representative image of immunoblot analysis (top) and quantification of the Satb2 protein level (bottom) are shown, n = 3–7; ANOVA followed by Hochberg post hoc test, F4,22 = 12.5, Ctrl vs. BDNF, p = 0.002, Ctrl vs. BDNF+ TTX, p = 0.001, Ctrl vs. Bic/4AP, p = 0.0004, Bic/4AP vs. Bic/4AP+TTX, p = 0.002. Treatments with Bic/4AP also contained MK-801. (D) Treatment with the Trk inhibitor K252a completely blocks the up-regulation of Satb2 by both BDNF and Bic/4AP Representative image of Western blot (top) and quantification of the Satb2 protein level (bottom) are shown, n = 4–6; ANOVA followed by Hochberg post hoc test, F4,20 = 15.6 Ctrl vs. BDNF, p = 0.001, Ctrl vs. Bic/4AP, p = 0.0001, BDNF vs. BDNF+K252a, p = 0.002, Bic/4AP vs. Bic/4AP+K252a, p = 0.0002. Treatment with Bic/4AP also contained MK-801. (E) Blockade of the ERK1/2 signaling pathway with UO126 inhibits the induction of Satb2 by BDNF. Representative image of Western blot (top) and quantification of Satb2 protein levels (bottom) are shown, n = 4; ANOVA followed by Tukey post hoc test, F3,12 = 26.7, Ctrl vs. BDNF, p = 0.003; BDNF vs. BDNF+UO126, p = 0.001. (F) Inhibition of ERK1/2-downstream kinase MSK1 prevents BDNF-induced Satb2 up-regulation. Representative image of Western blot (top) and quantification (bottom) are shown, n = 4–5; ANOVA followed by Hochberg post hoc test, F2,11 = 11.4, Ctrl vs. BDNF, p = 0.002, BDNF vs. BDNF+SB747651A, p = 0.018. In (A–F), data are presented as mean ± SEM of the indicated number of experiments, n values refer to the number of independent hippocampal cultures, *p < 0.05; **p < 0.01; ***p < 0.001, compared with Ctrl; #p < 0.05; ##p < 0.01; ###p < 0.001, compared with BDNF; +p < 0.05; ++p < 0.01; +++p < 0.001, compared with Bic/4AP. Since BDNF expression and secretion in the CNS are controlled by neuronal activity we reasoned that the induction of Satb2 following AP bursting might be due to enhanced Bdnf transcription, translation and/or BDNF release (Hardingham et al., 2002; Kuczewski et al., 2009; Tao et al., 1998). To further investigate this possibility we inhibited Trk signaling with K252a during Bic/4AP stimulation. As a control experiment, we pharmacologically blocked AP bursting with the sodium channel blocker tetrodotoxin (TTX) during BDNF treatment. We found that silencing the neuronal activity with TTX did not affect BDNF-induced Satb2 expression, even though it abolished the synaptic activity-driven Satb2 induction (Figure 4C). In contrast, synaptic activity-triggered increase of Satb2 was blocked by Trk antagonism (Figure 4D), suggesting that synaptic activity-triggered Satb2 induction is indeed mediated via BDNF/TrkB signaling. De novo gene transcription is necessary for this process since actinomycin D, an inhibitor of gene transcription, blocked BDNF-driven Satb2 up-regulation (Figure 4—figure supplement 1). To determine if MEK1/2 - ERK1/2 pathway (Minichiello, 2009) contributes to BDNF-triggered Satb2 induction we applied the MEK1/2 inhibitor UO126 1 hr prior to BDNF stimulation. UO126 blocked the induction of Satb2 by BDNF (Figure 4E). Furthermore, inhibition of mitogen/stress-activated kinase 1 (MSK1), a major regulator of activity- and experience-dependent synaptic adaptation downstream of MEK1/2 (Corrêa et al., 2012), had the same effect as the inhibition of MEK1/2 (Figure 4F), indicating that in hippocampal neurons BDNF up-regulates Satb2 through a pathway that requires ERK1/2 and MSK1. Finally, we examined the temporal pattern of Satb2 induction by BDNF. Satb2 protein was increased at 6 hr, reached a maximum within 12–24 hr, and remained at this level for 48 hr following BDNF stimulation (Figure 4—figure supplement 2A). 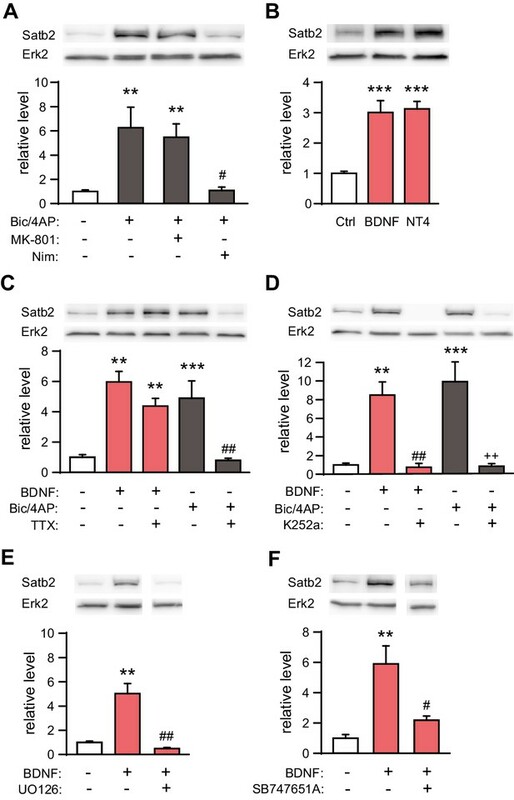 Loss of Satb2 occurred with a similar kinetic after antagonizing Trk receptor signaling in cultures previously stimulated with BDNF for 24 hr (Figure 4—figure supplement 2B). The relatively slow kinetics of Satb2 induction and elimination in hippocampal neurons is consistent with a potential role of Satb2 in slow, long-lasting adaptive neuronal processes (Zagrebelsky and Korte, 2014). Satb2 binding sites are enriched on active gene promoters including miRNA promoters. (A) Pie-chart illustrating the genomic annotation of Satb2 binding sites. (B) Heatmap of Satb2 binding to TSS (±3 Kb) regions. (C) Average profiles of H4K16ac, H3K27ac, H3K4me1, H3K4me2, H3K4me3 and PolII peaks (GEO: GSE63271, GSE66701, GSE21161, and GSE65159) at Satb2 bound promoters. (D) Average tag density profiles (ChIP/Input, left panel) and heat map depicting Satb2 ChIP-seq tag density at predicted miRNA promoter regions (right panel). ‘L’ – 5’ left, ‘R’ – 3’ right of the miRNA promoters. The tick marks represent distance of −3 kb, −1.5 kb, +1.5 kb, +3 kb relative to the miR promoters. Given that the majority of annotated gene promoters are associated with CpG islands (Deaton and Bird, 2011) we examined if Satb2 localizes to CpG islands. ChIP-seq tag distribution profiles revealed that Satb2 was deposited at CpGs associated with proximal promoters, intragenic (gene body associated) or intergenic CpGs (Figure 5—figure supplement 3A–C). Evidence suggests that most of the latter two CpG classes represent alternative promoters of nearby annotated genes or TSSs for non-coding RNAs (Monteys et al., 2010; Wang et al., 2010). Indeed, we found Satb2 enrichment on miRNA-associated CpGs (Figure 5—figure supplement 3D). To further explore if Satb2 binds to miRNA TSSs, we used a recently developed miRNA promoter prediction method (Marsico et al., 2013) to assess potential enrichment of Satb2 on miRNA promoters. The miRNA TSS identification algorithm that we applied detected at least one TSS for about 82% of the miRBase-annotated miRNAs (Marsico et al., 2013). Furthermore, it is particularly suited for detection of intronic miRNA promoters, which often act independently from the host gene promoters (Monteys et al., 2010). Our analysis revealed significant association of Satb2 with miRNA promoters (Figure 5D). To confirm that endogenous Satb2 in the adult hippocampus binds to the same regions identified by ChIP-seq in hippocampal cultures we performed ChIP-qPCR using a Satb2-specific antibody and chromatin derived from control and Satb2 cKO CA1 hippocampal tissue. The results revealed Satb2 enrichment at various identified target promoters and/or Satb2 binding sites in chromatin samples from control but not Satb2 cKO mice, thus validating the in vitro Satb2 genomic binding patterns (Figure 5—figure supplement 4). Taken together, our results provide evidence for association of Satb2 with active promoter regulatory sequences in the genome of hippocampal neurons, including miRNA promoters, suggesting a potential role of Satb2 in the transcription of active neuronal chromatin. To study the role of Satb2 in transcriptional control in vivo, we performed global transcriptome profiling analyses (RNA-seq and small RNA-seq) using CA1 hippocampal tissue from Satb2 cKO mice and littermate controls. RNA-seq analysis identified a number of protein-coding genes that were differentially expressed between control and Satb2 cKO mice (25 up-regulated and 15 down-regulated, Figure 6—source data 1). Amongst them we found genes that have previously been identified as highly relevant for learning and memory or directly implicated in memory formation such as Adra2a, Penk, Htr5b, and Ghsr (Diano et al., 2006; Galeotti et al., 2004; Ghersi et al., 2015; Peppin and Raffa, 2015). Pathway analysis revealed significant enrichment (p=0.018) of the ‘neuroactive ligand-receptor interaction pathway’ amongst the regulated genes. The differential expression of selected genes, including Adra2a, Penk, Htr5b, and Ghsr was validated by real-time qPCR (Figure 6—figure supplement 1). Notably, Satb2 was bound to the promoters of the majority of the identified differentially expressed genes as shown by Satb2 ChIP-seq (Figure 6—source data 1). We also investigated differential splicing between the CA1 transcriptomes of Satb2 cKO mice and littermate controls, since global de-regulation of RNA-splicing has been linked to impaired synaptic plasticity and memory function (Benito et al., 2015). However, no major difference in RNA-spicing was observed comparing Satb2 cKO and control mice (Figure 6—source data 2). Next, we performed small RNA-seq analysis to examine miRNA transcriptome changes in the CA1 hippocampal area of Satb2 cKO vs control mice. We detected the expression of 476 miRNAs in the CA1 tissue, similar to the number reported for this hippocampal subfield in a previous study (Stilling et al., 2014). Of these 464 miRNAs 43.9% showed significant differential expression between Satb2 cKO and control mice (Figure 6A, Figure 6—source data 3). Principal component analysis, a method for visualizing gene expression patterns, revealed a clear separation between Satb2 cKO and control samples (Figure 6B). Furthermore, hierarchical clustering using a Pearson correlation-based method demonstrated two main clusters of miRNAs (up- and down regulated) based on their expression levels in the CA1 field of Satb2 cKO vs control mice (Figure 6C). The differential expression of selected miRNAs in the CA1 tissue of control vs. Satb2 cKO mice was validated by qPCR (Figure 6—figure supplement 2). 44.4% of the miRNAs found to be deregulated in Satb2 cKO mice had at least one predicted promoter occupied by Satb2 as demonstrated by Satb2 Chip-seq data (Figure 6—figure supplement 3 and Figure 6—source data 4). Moreover, in vivo Chip-qPCR analysis using an antibody against Satb2 and chromatin from CA1 tissue demonstrated that Satb2 can bind to the miR-22 promoter (Figure 5—figure supplement 4). Importantly, amongst the miRNAs identified as deregulated in Satb2 cKO mice there were miRNAs with well-documented synaptic regulatory functions, including miR-125b, miR-132, miR-212, miR-124 (McNeill and Van Vactor, 2012), or miRNAs which have been directly implicated in learning and memory, such as miR-132 or miR-124 (Hansen et al., 2010; Malmevik et al., 2016). Satb2 regulates miRNA expression in CA1 hippocampal area. (A) Pie-chart showing the percentage of differentially expressed miRNAs (up-and down-regulated, Figure 6—source data 1) in the CA1 region of Satb2 cKO mice vs. littermate controls as assessed by small RNA-seq analysis (base mean above 10 counts, 1.5-fold change, and adjusted p < 0.05). (B) PCA plot of miRNA counts analyzed by small RNA-seq of Satb2 cKO vs. control CA1 hippocampal tissue. The first two PCs explained 33.3% and 21.4% of the variance, respectively. (C) Heat map from hierarchical clustering of differentially expressed miRNAs (base mean above 100 counts) in the CA1 hippocampal area of Satb2 cKO mice (n = 9) vs. littermate controls (n = 9). Collectively, the transcriptome profiling results provide evidence for an important role of Satb2 as a regulator of hippocampal miRNA expression. Among the miRNAs up-regulated in the CA1 of Satb2 cKO mice, 24 miRNAs were predicted to target the 3’UTR of ‘activity–regulated cytoskeletal associated protein’ (Arc) by at least one of the miRNA-target prediction tools TargetScan, miRanda, and PITA (Figure 7—source data 1). Moreover, regulation of Arc translation by multiple miRNAs has already been demonstrated in primary hippocampal neurons (Wibrand et al., 2012). Given the crucial role of Arc in experience-dependent synaptic plasticity and long-term memory (Korb and Finkbeiner, 2011; Shepherd and Bear, 2011) and the deficits in LTP and fear memory observed in Satb2 cKO mice, we examined whether Arc protein is altered in vivo in the CA1 of Satb2 mutants. Indeed, immunoblotting analysis revealed significantly reduced Arc protein level in Satb2 cKO mice compared to littermate controls (Figure 7A). At the same time, Arc mRNA level was not altered (Figure 7B). Hippocampal Satb2 re-expression rescues Arc levels and long-term fear memory deficits. (A) Representative Western blot (left) and quantification (right) of Arc protein level in the CA1 field of Satb2 cKO mice and littermate controls. β3-tubulin was used as a loading control (Ctrl, n = 9; cKO, n = 11; Student's t test, t18 = 4.52, p = 0.0003). Data are presented as mean ± SEM, n values refer to the number of mice per group, ***p < 0.001 compared to Ctrl. (B) qPCR quantification of Arc mRNA level in the CA1 field of Satb2 cKO mice and littermate controls (Ctrl, n = 3; cKO, n = 4; Student's t test, t5 = 1.14, p = 0.303). Data are presented as mean ± SEM, n values refer to the number of mice used. (C) Satb2/V5-immunoreactivity in the CA1 hippocampal area of Satb2 cKO mice after stereotaxic injection of rAAV-hSyn-Satb2-V5 into the dorsal hippocampus. Nuclei were counterstained with RedDot. Representative images are shown. Scale bar: 150 μm. (D) Representative Western blot (left) and quantification (right) of Arc protein level in the CA1 field of Satb2flox/flox mice injected with rAAV-hSyn-eGFP (Ctrl:AAV-GFP, n = 7), Satb2 cKO mice injected with rAAV-hSyn-eGFP (cKO:AAV-GFP, n = 3) and Satb2 cKO mice injected with rAAV-hSyn-Satb2-V5 (cKO:AAV-Satb2, n = 6). β3-tubulin was used as a loading control. 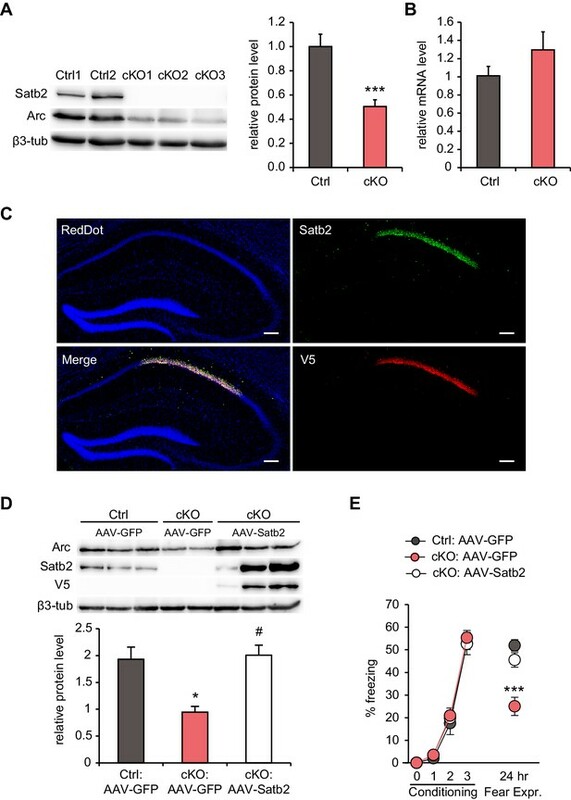 Re-expression of Satb2 in the dorsal hippocampus rescued the reduction in Arc protein in the CA1 area of Satb2 cKO mice, bringing it up to control levels (ANOVA followed by Fischer LSD post hoc test, F2,13 = 5.011, cKO:AAV-GFP vs. Ctrl:AAV-GFP, p = 0.014, cKO:AAV-Satb2 vs. cKO:AAV-GFP, p = 0.011, Ctrl:AAV-GFP vs. cKO:AAV-Satb2, p = 0.793). Data are presented as mean ± SEM, n values refer to the number of mice used, *p < 0.05 compared with Ctrl:AAV-GFP, #p < 0.05, compared with cKO:AAV-GFP. (E) In a contextual fear conditioning test, Ctrl:AAV-GFP (n = 9), cKO:AAV-GFP (n = 9) and cKO:AAV-Satb2 (n = 14) mice showed similar levels of freezing during the fear-acquisition phase (repeated measures ANOVA, F6,87 = 0.12, p = 0.99). Freezing behavior, analyzed 24 hr after the training, was significantly impaired in cKO:AAV-GFP mice, however the fear memory deficit was completely rescued in cKO:AAV-Satb2 mice (ANOVA followed by Fischer LSD post hoc test, F2,29 = 12.8, cKO:AAV-GFP vs. Ctrl:AAV-GFP, p = 0.00005, cKO:AAV-Satb2 vs. cKO:AAV-GFP, p = 0.0004, Ctrl:AAV-GFP vs. cKO:AAV-Satb2, p = 0.22). Data are presented as mean ± SEM, n values refer to the number of mice per group, ***p < 0.001 compared with cKO:AAV-Satb2 and Ctrl:AAV-GFP. To investigate if restoring Satb2 expression can rescue the observed reduction in Arc level and/or the impaired long-term fear memory of Satb2 cKO mice, we used rAAV-mediated gene delivery to re-introduce Satb2 into the hippocampus of Satb2 mutants. Viral vectors encoding either Satb2 (rAAV8-hSyn-Satb2-V5) or GFP (rAAV8-hSyn-GFP) were injected into the dorsal hippocampus of Satb2 cKO mice four weeks prior to immunoblotting analysis or contextual fear conditioning training. Littermate Satb2flox/flox mice, injected with rAAV8-hSyn-GFP, served as controls. Immunohistochemistry analysis confirmed robust and specific expression of V5-tagged Satb2 in the hippocampal CA1 region of conditional mutants after stereotaxic injection of rAAV8-hSyn-Satb2-V5 (Figure 7C). Immunoblotting results revealed that rAAV8-hSyn-Satb2-V5 injection was able to restore Arc protein levels in the CA1 area of Satb2 cKO mice to control levels (Figure 7D). Moreover, the reinstatement of Satb2 in the dorsal hippocampus not only reversed the decreased Arc protein level, but also rescued the long-term contextual fear memory impairment. We observed indistinguishable freezing behavior between control and rAAV8-hSyn-Satb2-V5-transduced Satb2 cKO mice 24 hr after training (Figure 7E). By contrast, Satb2 cKO mice injected with rAAV8-hSyn-GFP showed significantly reduced freezing, reproducing our initial findings with un-injected animals (Figure 2A). Our results establish Satb2 as an important determinant of memory consolidation in the adult hippocampus. At molecular level we show in primary hippocampal neurons that calcium influx through L-type VGCC as well as BDNF up-regulate Satb2 in the nucleus, where it binds to promoters of coding and non-coding loci. Altered expression of Satb2-dependent miRNAs on a genome-wide scale is likely to cause changes in the posttranscriptional regulation of synaptic plasticity proteins, exemplified by Arc. Consistent with these molecular mechanisms, the lack of Satb2 in the forebrain causes impairments in late-phase LTP and long-term memory in adult mice. Given the potential of Satb2 to mediate DNA looping and local association of gene promoter regions (Zhou et al., 2012), our findings suggest that some of the key functions of the hippocampus may depend on changes in the higher-order chromatin architecture. Long-range looping interactions between promoters and distal regulatory elements are considered to recruit transcription factors and chromatin-modifying complexes to gene promoters (Bharadwaj et al., 2014; Sanyal et al., 2012). Our data demonstrating specific binding of Satb2 to active coding or non-coding gene promoters, co-occupied by RNA Pol II, are consistent with this model. 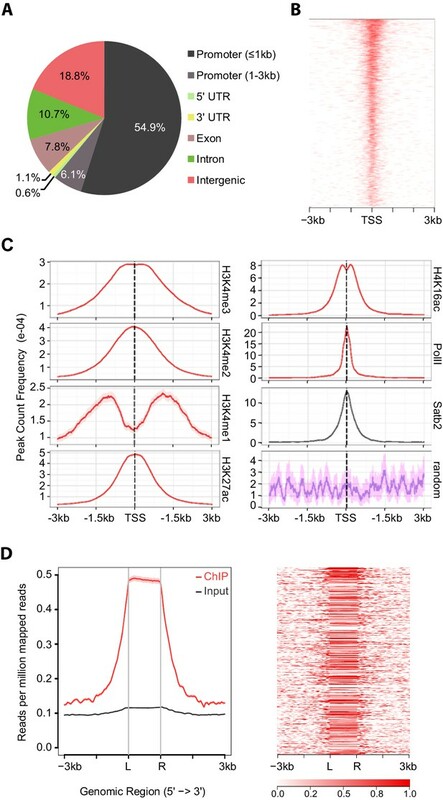 Based on our results in primary hippocampal cultures, it can be proposed that this type of higher-order chromatin rearrangement is an activity- and BDNF-dependent process that involves changes in Satb2 expression levels. Of note, the reported schizophrenia risk allele for SATB2 (rs6704641) is intronic and likely affects SATB2 mRNA levels rather than protein function (Schizophrenia Working Group of the Schizophrenia Working Group of the Psychiatric Genomics Consortium, 2014). This finding strengthens the hypothesis that quantitative changes in Satb2, which otherwise is expressed in all CA1 pyramidal neurons, impact on Satb2-chromatin interactions. The relevance of chromatin looping in cognition or psychiatric diseases has already been shown for the regulation of individual genes: the NMDA receptor locus GRIN2B46 (Bharadwaj et al., 2014), and two schizophrenia-risk genes, encoding the GABA synthesis enzyme GAD1 and the calcium channel alpha subunit CACNA1C (Nestler et al., 2016; Rajarajan et al., 2016). Noteworthy, the homologue of Satb2, Satb1, a known chromatin structure organizer, affects the formation of dendritic spines and modulates the expression of multiple immediate early genes in the cortex (Balamotis et al., 2012), thus corroborating the importance of Satb family members in neuronal plasticity. We found that a large fraction of all miRNAs expressed in the adult CA1 hippocampal field is deregulated when Satb2 is genetically ablated. This establishes Satb2 as a novel regulator of the miRNA transcriptome in CA1 pyramidal neurons. Notably, several miRNAs with altered expression in Satb2 mutants, e.g. miR-124, miR-125b, miR-132, miR-212, miR-381, miR-326, miR-19b have already been shown to affect the translation of proteins important in various aspects of synaptic plasticity or memory formation (Aksoy-Aksel et al., 2014; Ryan et al., 2015). At synaptic sites translation of locally synthesized proteins is at least in part repressed by miRNAs. The miRNA machinery interacts with fragile X mental retardation protein (FMRP), which acts as translational repressor. Intriguingly, almost all of the miRs found to be associated with FMRP (miR-100, miR-124, miR-125a, miR-127, miR-128, miR-132, miR-143) (Edbauer et al., 2010) were up-regulated in Satb2 mutants. This finding implies a decreased expression of synaptic proteins after Satb2 ablation and it also provides interesting candidates for future investigations. In our study, we have already demonstrated a decreased level of Arc in the CA1 of Satb2 cKO mice. The identification and validation of additional Satb2-dependent miRNA–mRNA interactions in vivo in the adult brain will be important to elucidate the mechanisms, by which Satb2 regulates memory formation. Recent studies have demonstrated enhanced spatial learning and working memory capacity after inhibition of miR-124 in the hippocampus or restored spatial memory, social interaction and LTP impairments in adult mice carrying a null mutation for EPAC protein (Malmevik et al., 2016; Yang et al., 2012). Our data showing up-regulation of miR-124 and impaired LTP and long-term memory in Satb2 mutants are in full agreement with these reports. Interestingly, amongst the miRNAs deregulated in Satb2-deficient CA1 we also found miRNAs shown to be deregulated in schizophrenia animal models or in schizophrenia patients (Beveridge and Cairns, 2012). Although the precise mechanism(s) of Satb2-dependent miRNA regulation remain to be determined, two lines of argument support the view that Satb2 has a direct influence on miRNA transcription. First, we find individual miRNAs to be up- as well as down-regulated, arguing against a general effect of Satb2 on miRNA biogenesis or processing by the regulation of Dicer as has been reported for BDNF (Huang et al., 2012). Second, we find that miRNA promoter elements are bound by Satb2 in hippocampal neurons. Our ChIP-seq data in primary cultures demonstrate a potential of Satb2 to occupy both sets of promoters (protein-coding and non-coding). The preferential regulation of miRNA expression over protein-coding genes that we observed in vivo might for example be explained by the presence of Satb2 co-interactors in mature neurons that determine selective binding and control of miR promoters. In conclusion, we provide evidence that Satb2 is required for synaptic plasticity and long-term memory formation in the adult CNS, likely via the regulation of miRNAs and protein-coding genes controlling synaptic structure and function. Our findings offer a plausible mechanism explaining the intellectual disability and severe learning difficulties observed in SAS patients. Furthermore, the Satb2 function in the adult brain unsuspectedly interconnects several individual components that have been discussed in the context of various psychiatric syndromes: BDNF signaling, epigenetic chromatin modifications, miRNA dysregulation and cognitive dysfunction. Therefore, in the future, it will be intriguing to establish Satb2flox/flox::Camk2a-Cre conditional mutant as an animal model of neuropsychiatric diseases. Mice carrying an allele of Satb2 in which exon 4 is flanked by loxP sites (Satb2flox/flox) were generated by microinjection of ES cells carrying a Satb2tm1a(KOMP)Wtsi Knockout First (Promoter driven) allele (clone Satb2_G07, JM8.N4 subline; KOMP repository) into blastocysts from albino C57BL/6J donor mice. The germline-positive mice were further crossed with FLPo deleter mice (RRID:MMRRC-032247-UCD) (Kranz et al., 2010) to excise the FRT cassette and to establish a conditional allele. To generate Satb2 conditional mutants Satb2flox/flox mice were crossed with Camk2a-Cre mice (Minichiello et al., 1999) on a C57BL/6 background. In all experiments, mice that carry the floxed exon 4 but do not express the Cre transgene (Satb2flox/flox) were used as littermate controls. Unless otherwise stated, adult male mice at the age of 3–4 months were used for behavioral and molecular analyses. All experimental procedures were approved by the Austrian Animal Experimentation Ethics Board (Bundesministerium für Wissenschaft und Verkehr, Kommission für Tierversuchsangelegenheiten). Primary antibodies. Satb2 ab92446 (AB_10563678), V5 tag antibody ChIP grade ab15828 (AB_443253), Satb2 ab34735 (AB_2301417), Ctip2 ab18465 (AB_2064130), Tbr1 ab31940 (AB_2200219) were purchased from Abcam (Cambridge, MA); Erk2 sc-154-G (AB_631459), Arc sc-17839 (AB_626696), Cux1 sc-13024 (AB_2261231) were obtained from Santa Cruz (Dallas, TX); Arc 156 003 (AB_887694) was ordered from Synaptic Systems (Germany); V5 epitope tag antibody R960-25 (AB_2556564) was obtained from Thermo Fisher Scientific (Waltham, MA); Satb2 AMAb90682 was purchased from Atlas Antibodies (Sweden); Wfs1 11558–1-AP (AB_2216046) was ordered from Proteintech (Rosemont, IL); and beta-III Tubulin antibody NB100-1612 (AB_10000548) was obtained from Novus Biologicals (UK). Secondary antibodies. Goat anti-mouse Alexa-488 A11001 (AB_2534069), donkey anti-mouse Alexa-488 A21202 (AB_2535788), goat anti-rabbit Alexa-555 A21428 (AB_10561552), donkey anti-rabbit Alexa-488 A21206, donkey anti-rat Alexa 488 A21208 (AB_2535792) were all purchased from Thermo Fisher Scientific; and goat anti-mouse CF633 20121 (AB_10854245) was obtained from Biotium (Fremont, CA). Hippocampi were dissected from newborn C57BL/6J mice at postnatal day P0 to P1. Hippocampal tissue was trypsinized and dissociated by trituration as described previously (Kaech and Banker, 2006). Neurons were plated on 35 mm tissue culture dishes or on 18 mm coverslips, previously coated with poly-L-ornithine (Sigma, St. Louis, MO) and laminin (Thermo Fischer Scientific), at a density of 8×104 cells/cm2. Cells were cultured in Neurobasal medium (Thermo Fisher Scientific) containing B-27 supplement (Thermo Fisher Scientific), 100 mg/ml penicillin G and 60 mg/ml streptomycin sulfate in a humidified atmosphere of 5% CO2 at 37°C for 8–10 days. Medium was replaced 1.5 hr after plating; thereafter one third of the culture medium was replaced with fresh medium at day in vitro (DIV) 3 or 4. Glial cell proliferation was inhibited by adding 5 µM cytosine arabinoside (Sigma) to the culture medium at DIV1. Cells were collected for immunoblotting analysis 24 hr after treatment. The following growth factors were used: BDNF (50 ng/ml, Peprotech, Rocky Hill, NJ), NT4/5 (50 ng/ml, a kind gift from Amgen-Regeneron). The following pharmacological substances were applied as described in the Results section: 50 μM bicuculline (Tocris Bioscience, UK), 500 μM 4-aminopyridine (Tocris Bioscience). Pharmacological inhibitors were added 1 hr prior to treatments with BDNF or Bic/4AP in the following concentrations: 10 μM nimodipine (Tocris Bioscience), 10 μM MK-801 (Tocris Bioscience), 10 μM SB202190 (Cell Signaling, Danvers, MA), 10 μM UO126 (Cell Signaling), 0.2 μM K252a (Santa Cruz), 333 ng/ml actinomycin D (Sigma) and 20 µM SB747651A (Axon Medchem, The Netherlands). Control cultures were treated with equal volumes of vehicle. Extracts of total protein were prepared by lysis of neurons on the cell culture dish in 2 x Roti-Load sample buffer (Carl Roth, Germany). Western blotting was performed as described previously (Loy et al., 2011). Membranes were blocked with 5% milk powder in TBST (0.1% Tween 20 in TBS) for 1 hr and then incubated overnight at 4°C with the corresponding primary antibodies, diluted in blocking solution. After incubation with HRP-coupled secondary antibodies, the blots were developed using ECL reagent (GE Healthcare, Chicago, IL). Blots were either developed using CP100 photo-developer (Agfa, Belgium) or FUSION-FX7 chemiluminescence detection system (Vilber Lourmat, France). Quantification of protein expression was carried out either by using ImageJ (RRID:SCR_003070) or FUSION-CAPT image analysis software in the linear range of detection. Mice were anesthetized and transcardially perfused with 4% PFA (w/v) in PBS (pH 7.4). Brains were removed, post-fixed for 2 hr in 4% PFA, cryo-protected in 30% (w/v) sucrose at 4°C and embedded in Tissue-Tek medium (Sakura Finetek Europe, The Netherlands). Free-floating cryosections (40 µm) were washed three times in Tris-Buffered Saline (TBS), permeabilized in 0.3% (v/v) Triton-X-100 in TBS for 5 min and incubated with blocking solution (10% (v/v) normal serum, 1% (w/v) BSA, 0.3% Triton-X-100 in TBS) for 2 hr. Sections were incubated with primary antibodies overnight at 4°C. After three washes in 0.025% Triton-X-100 in TBS sections were incubated with corresponding secondary antibodies. Sections were counterstained with Hoechst 33258 (H-3569, Molecular Probes, Grand Island, NY) for 5 min or with RedDot2 (40061, Biotium, Fremont, CA) for 20 min. After three washes in TBS sections were mounted with Roti-Mount FluorCare mounting medium (Carl Roth, Germany). Images were acquired using a LSM 510/Axiovert200M microscope (Carl Zeiss, Germany). For cresyl violet staining free-floating brain sections (40 µm) were mounted on glass slides and incubated in cresyl violet (0.1 M sodium acetate, 2% acetic acid, 0.02 M cresyl violet acetate, Sigma, St. Louis, MO, in distilled water, pH 3.5). AAV8-hSyn-eGFP and AAV8-hSyn-GFP-Cre were purchased from UNC Gene Therapy Vector Core. Satb2 coding sequence was V5-tagged and cloned into pAAV-hSyn-WPRE vector. AAV-hSyn-Satb2-V5, serotype 8, was generated by SignaGen Laboratories, Rockville, MD. Hippocampal neurons were transduced with AAVs (AAV8-hSyn-GFP-Cre or AAV8-hSyn-Satb2-V5) at a multiplicity of infection 1.5 × 105 at DIV4 and used for ChIP-seq analysis at DIV11. 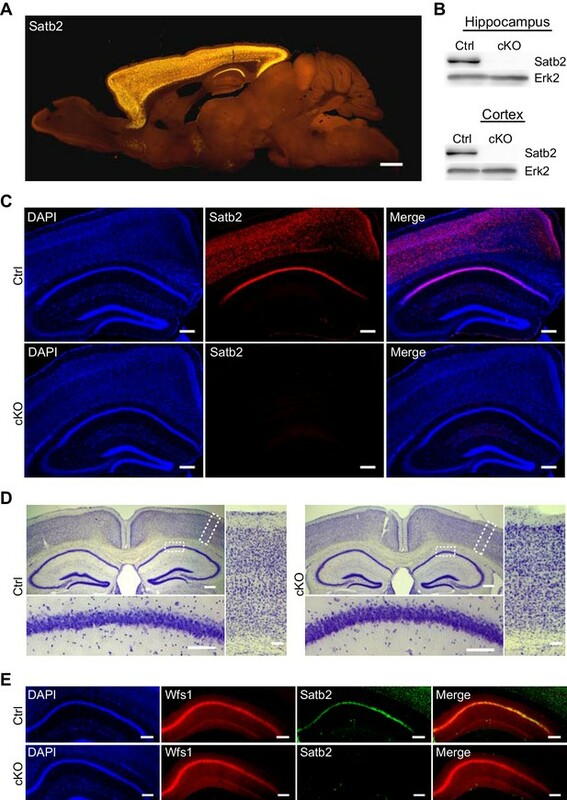 AAV8-hSyn-eGFP and AAV8-hSyn-Satb2-V5 were delivered by stereotaxic injection into the dorsal hippocampus of 12 week old male mice (Satb2 cKO and control littermates). A burr hole was drilled into the skull, and 1 μl of viral stock (1012–1013 vg/ml) was injected bilaterally at a rate of 100 nl/min. The following coordinates (relative to Bregma) were used: antero-posterior, −2.1 mm; medio-lateral, ± 1.5 mm; dorso-ventral, −1.5 mm from the skull surface. The needle was left in place for 5 min after the injection. The mice were allowed to recover for four weeks after stereotaxic injections. Infection efficiencies of AAVs were determined by immunohistochemistry using antibodies to Satb2 or V5-tag or by analyzing the fluorescence of eGFP. Total RNA was isolated from primary hippocampal cultures or dissected CA1 hippocampal tissue using TRIzol reagent (Thermo Fisher Scientific). cDNA was synthesized following the High-Capacity cDNA Reverse Transcription Kit protocol (Thermo Fisher Scientific). qPCR was performed using Fast SYBRGreen Master Mix (Thermo Fisher Scientific). All reactions were run in duplicates. The relative expression values were determined by normalization to Gapdh transcript levels and calculated using the ∆∆CT method (Pfaffl, 2001). Primers used for RT-qPCR analysis are listed in Supplementary file 1. Real-time PCR analysis of miRNAs was carried out using the miScript PCR System (Qiagen, Germany) following the manufacturer’s instructions. RNA was isolated from dissected CA1 hippocampal tissue using TRIzol (Thermo Fisher Scientific). Library preparation and cluster generation for mRNA and small RNA sequencing was performed according to Illumina standard protocols (TruSeq, Illumina, San Diego, CA). Libraries were quality-controlled and quantified using a Nanodrop 2000 (Thermo Fisher Scientific), Agilent 2100 Bioanalyzer (Agilent Technologies, Santa Clara, CA) and Qubit (Thermo Fisher Scientific). Base calling from raw images and file conversion to fastq-files was achieved by Illumina pipeline scripts. Subsequent steps included quality control (FastQC, www.bioinformatics.babraham.ac.uk/projects/fastqc/), mapping to reference genome (mm10, STAR aligner v2.3.0 (Djebali et al., 2012), non-default parameters), read counting on genes or exons (HTSeq, http://www-huber.embl.de/users/anders/HTSeq, mode: intersection-non-empty) and differential gene expression (DESeq2_1.4.5 [Love et al., 2014]) bio-statistical analysis. PCA and distance heatmaps were generated in R following instructions in the vignette for DESeq2. A threshold cutoff of 1.5-fold change and adjusted (Benjamini-Hochberg) p value < 0.05 was applied. Functional annotation and pathway analysis were carried out using the Database for Annotation, Visualization and Integrated Discovery (DAVID, RRID:SCR_003033) (Huang et al., 2009). AAV8-hSyn-Satb2-V5-transduced DIV11 primary hippocampal neurons were cross-linked with formaldehyde at 1% final concentration for 10 min at room temperature, and chromatin was prepared using the Zymo-Spin ChIP kit (Zymo Research, Irvine, CA) following manufacturer’s instructions. Sonication was performed at high power setting for 40 cycles (30 s ON, 30 s OFF) using a Bioruptor Plus (Diagenode Inc., Denville, NJ), yielding fragment size range of 200–700 bp. ChIP assays were performed in triplicates using 20 μg of chromatin and 10 μg of anti-V5 tag antibody (ab15828). IgG (12–370, Millipore, Billerica, MA) was included as a negative control. ChIP DNA was purified using ChIP DNA Clean and Concentrator (Zymo Research) and the relative abundance of a control region in V5-immunoprecipitated DNA was quantified by qPCR with sequence-specific primers. DNA libraries (Satb2-ChIP and Input control DNA) were prepared and sequenced on a HiSeq 2000 sequencer (Illumina). Sequencing resulted in 39,309,191 and 88,731,003 high quality filtered 20–50 bp single end reads for ChIP- and Input DNA respectively. These reads were aligned to the mm10 mouse genome using the BWA short read aligner (Li and Durbin, 2009) (version 0.7.12). The aligned reads were filtered to keep only uniquely mapping reads (ChIP: 15,507,953 Input: 51,700,265). A cross-correlation analysis was performed to assess quality metrics (Phantompeakqualtools package, RRID:SCR_005331). The resulting NSC (=1.24) and RCS (=0.82) values met the ENCODE quality thresholds (NSC ≤ 1.05, RCS ≤ 0.8) (Landt et al., 2012). Peaks of enriched Satb2 binding were called using MACS2 (RRID:SCR_013291) (Zhang et al., 2008) (version 2.1.0), by allowing only one tag at the same location and setting the false discovery rate to 0.01 and the fold-enrichment cutoff to 2. This resulted in 8414 high confidence peaks and a fraction of reads in peaks (FriP) of 6.2% which is well above the ENCODE requirements for good quality data. Peak annotation and comparisons with other public data sets were performed with the R/Bioconductor packages ChIPseeker (Yu et al., 2015) and ngs.plot (RRID:SCR_011795) (Shen et al., 2014). Testing of ChIP-seq peak data for the enrichment of biological pathways and Gene Ontology terms was performed by using ChIP-Enrich tool (Welch et al., 2014). Public datasets (GSE63271, GSE66701, GSE21161, GSE65159) (Gjoneska et al., 2015; Kim et al., 2010; Telese et al., 2015; Wang et al., 2015) were downloaded from GEO and genomic coordinates were lifted over to mouse mm10 for data sets which were only available in a differing genome assembly version. Datasets that did not contain peak data (BED files) were reanalyzed by mapping quality filtered raw reads to mm10 and calling peaks using MACS2. ChIP was performed on microdissected adult mouse CA1 tissue (a pool of 8–10 mice) by using the Zymo-Spin ChIP kit (Zymo Research) following manufacturer’s instructions. Briefly, 100 mg of CA1 tissue were cross-linked with 1% formaldehyde (Sigma) for 10 min at RT and neutralized with 0.125M glycine. Chromatin was fragmented using a Bioruptor Plus sonicator (Diagenode Inc., Denville, NJ), yielding fragment size range of 200–500 bp. Sonicated chromatin (10–15 µg) was incubated at 4°C overnight with 5 µg antibodies (ab34735, AB_2301417, Abcam or normal rabbit IgG 12–370, AB_145841, Millipore). After washing, ChIP-ed DNA was eluted; reverse cross-linked at 65°C for 2 hr and purified using Zymo-Spin ChIP kit (Zymo Research). Contextual fear conditioning was performed in a 25 × 25 × 35 cm chamber with transparent walls and a metal rod floor, cleaned with water and illuminated to 300 lux (TSE, Bad Homburg, Germany) as previously described (Busquet et al., 2008; Dobi et al., 2013; Sartori et al., 2011). After a 120 s acclimation period, mice were conditioned with three presentations of a 0.60 mA scrambled foot shock, with a 120 s inter-shock interval. The mice were allowed to remain in the chamber for an additional 120 s following the last stimulus presentation. Short-term and long-term fear memories were tested 1 hr and 24 hr later respectively in the conditioning chamber. Freezing was measured as an index of fear (Blanchard and Blanchard, 1969) manually scored based on DVD recordings, defined as no visible movement except that required for respiration, and converted to a percentage [(duration of freezing /total time) × 100] by a trained observer blind to the animals’ group/genotype. Prior to training, mice were handled 1–2 min for five days and then habituated to the experimental apparatus (a 41 × 41 × 41 cm open field arena containing home-cage floor bedding and illuminated to 150 Lux; Tru Scan, Coulbourn Instruments, Holliston, MA) for 5 min a day for three consecutive days in the absence of objects. During the training period, mice were placed into the experimental apparatus containing two identical objects (blue colored Lego Duplo blocks 2.5 × 2.5 × 5 cm) and allowed to explore for 10 min. During the short-term (1 hr) or long-term (24 hr) retention tests, mice were placed in the experimental apparatus for 5 min. For assessment of spatial object location-dependent memory, one copy of the familiar object was placed in the same location as during the training trial, and one copy of the familiar object was moved and placed in the middle of the box. For the novel object recognition test (Antunes and Biala, 2012), one copy of the familiar object and a new object (100 ml glass beaker) were placed in the same location as during the training trial. Exploration was scored when the mouse’s nose touched the object. All training and testing trials were videotaped and analyzed by individuals blind to the genotype of subjects. The relative exploration time (t) was recorded and expressed as a percent discrimination index (D.I. = (tnovel − tfamiliar) / (tnovel + tfamiliar) × 100%). Mean exploration times were then calculated and the discrimination indexes between treatment groups compared. Animals that explored less than 3 s total for both objects during either training or testing were removed from the analysis. Reactivity to the foot shock was evaluated in the same apparatus used for contextual fear conditioning as previously described (Sartori et al., 2011). After a 120 s acclimation period, mice were subjected to a series of 1 s shocks of gradually increasing amperage (0.1 mA every 30 s) starting from 0.1 mA. Mice were scored for their first visible response to the shock (flinch), their first pronounced motor response (run or jump), and their first vocalized distress, as previously described (Wittmann et al., 2009). Acute hippocampal slices were prepared from 2–3 month old mice. In brief, mice were anesthetized and decapitated; the brain was quickly transferred into ice-cold carbogenated (95% O2, 5% CO2) artificial cerebrospinal fluid (ACSF) for 3 min. The ACSF used for electrophysiological recordings contained 125 mM NaCl, 2.5 mM KCl, 1.25 mM NaH2PO4, 2 mM MgCl2, 26 mM NaHCO3, 2 mM CaCl2, and 25 mM glucose. Hippocampi were cut with a vibratome (VT 101200S; Leica, Germany) into 400 µm thick transversal slices. Recordings were performed in a submerged recording chamber at 32°C. Field excitatory postsynaptic potentials (fEPSPs) were recorded in the stratum radiatum of the CA1 region with a glass micropipette (resistance: 3–15 MΩ) filled with 3 M NaCl at a depth of ca. 150–200 µm. Monopolar tungsten electrodes were used for stimulating the Schaffer collaterals at a frequency of 0.1 Hz. Stimulation was set to elicit a fEPSP with a slope of ca. 40–50% of maximum for LTP recordings. After 40 min of baseline stimulation, LTP was induced by applying theta-burst stimulation (TBS), in which a burst consisted of 4 pulses at 100 Hz which were repeated 10 times in a 200 ms interval (5 Hz). Three of such trains were used to induce LTP at 0.1 Hz. Basic synaptic transmission and presynaptic properties were analyzed via input-output (IO) measurements and paired-pulse facilitation (PPF). The IO-measurements were performed by application of a defined value of current (25–250 µA in steps of 25 µA). PPF was performed by applying a pair of two stimuli by different inter-stimulus intervals (ISI) ranging from 10, 20, 40, 80 to 160 ms. Data were collected, stored, and analyzed with LABVIEW software (National Instruments, Austin, TX). The initial slope of fEPSPs elicited by stimulation of the Schaffer collaterals was measured over time, normalized to baseline, and plotted as average ± SEM. Statistical analyses were performed using Student's t-test. Statistical analysis was conducted as indicated in the figure legends using SPSS software (SPSS Inc). Statistical significance was determined by Student’s t-test, one-way ANOVA or two-way ANOVA followed by appropriate post hoc test (Tukey, Hochberg, Bonferroni or Fisher’s LSD). Data represent mean ± SEM of at least three independent biological replicates. No statistical methods were used to predetermine sample sizes; however our sample sizes were similar to those reported in previous studies. The data distribution was assumed to be normal, but it was not formally tested, except for datasets with n > 10. The RNA-seq and ChiP-seq data sets are deposited at GEO under accession number GSE77005. Philosophical Transactions of the Royal Society B: Biological Sciences 369:20130515. Molecular and Cellular Biology 32:333–347. Biochimica Et Biophysica Acta (BBA) - Molecular Cell Research 1833:1672–1679. Journal of Clinical Investigation 125:3572–3584. Journal of Comparative and Physiological Psychology 67:370–375. European Journal of Neuroscience 21:658–668. European Journal of Neuroscience 27:865–873. American Journal of Medical Genetics Part A 164A:3083–3087. The American Journal of Human Genetics 82:477–488. Cold Spring Harbor Perspectives in Biology 4:a005751. Journal of Clinical Pharmacy and Therapeutics 40:155–166. Frontiers in Molecular Neuroscience 8:4. Journal of Biological Chemistry 289:27376–27385. American Journal of Medical Genetics Part A, 10.1002/ajmg.a.38022, 27774744. American Journal of Medical Genetics Part A 167:1026–1032. Journal of Biological Chemistry 287:30641–30652. Thank you for submitting your article "Satb2 determines miRNA Expression and Long-Term Memory in Adult CNS" for consideration by eLife. Your article has been favorably evaluated by a Senior Editor and three reviewers, one of whom is a member of our Board of Reviewing Editors. The reviewers have opted to remain anonymous. The chromatin-associated protein Satb2 is known to play important roles in neuronal fate determination in the developing brain, however its functions in mature neurons have not been explored. In this manuscript the authors use a Camk2-Cre to conditionally knockout Satb2 in mature forebrain neurons revealing impairments in hippocampal synapse plasticity and memory consolidation. in vivo RNAseq experiments revealed that a few dozen mRNAs and several hundred miRNAs were differentially expressed in hippocampus of cKO mice. They choose Arc as a potential microRNA target, found that its protein expression was reduced in Satb2 cKO hippocampus, and saw improved memory performance when Arc expression was rescued. Intermingled with these experiments, in cultured neurons they found that expression of Satb2 was induced by exogenous BDNF or bicuculline and showed that overexpressed Satb2 binds the promoters of both protein coding and non-coding genes, including a number of microRNA genes. All three reviewers were convinced of the high quality of the data and the novelty of the behavioral findings. However, all three raised concerns about the links between the mechanistic data and the behavioral data. Some of these concerns can be addressed in the text or through additional data analysis, but a few new experiments are essential to make the mechanistic data on Satb2 chromatin binding a compelling story to explain the behavioral results. 1) A major weakness of the ChIP experiments is that they are performed in cultured neurons with overexpressed Satb2 whereas the RNAseq data are derived from hippocampus of the cKO mice. To confirm that the culture/overexpression ChIP experiments are relevant for the in vivo gene expression data the authors need to confirm by ChIP-PCR that endogenous Satb2 is bound to these same regions in hippocampus of the cKO mice. Furthermore, as a control for the specificity of the V5 antibody in the overexpression ChIP, the minimum control is ChIP from uninfected neurons – this could be ChIP-PCR as well. 2) Several aspects of the analysis and description of the mRNAs and miRNA expression data need to be improved. The authors overemphasize the miRNA findings at the expense of discussing the mRNAs that are changed. In principle, there is nothing from the ChIP data selectively linking Satb2 with miRNA expression that justifies the emphasis on miRNAs when interpreting the behavioral results. The miRNA RNAseq data need to be validated by a second method just like the mRNA data are validated. A number of pre-miRNAs are usually detected in mRNAseq experiments, but apparently they are not differentially expressed in cKO mice. Could this suggest that Satb2 does not alter miRNA levels by regulating their transcription? The authors report that nearly 50% of all microRNAs are dysregulated in Satb2 cKO mice, whereas only a very small number of mRNAs show differences. This is not clearly explained by the ChIP data (which show Satb2-V5 bound to both sets of promoters). Some explanation should be offered. 3) As presented, the BDNF-dependent regulation of Satb2 doesn't help to build a cogent model to explain the functions of Satb2 in learning and memory or LTP. Do the authors think that regulation of expression contributes to the requirement for Satb2 in learning and memory? If so it would be interesting to see if activity-dependent expression of Arc is dysregulated in Satb2 knockouts. Do physiologically relevant stimuli induce the expression of Satb2 in vivo? If these data cannot be more tightly tied to the behavior they would be better off moved to the supplementary data. Thank you for resubmitting your work entitled "Satb2 determines miRNA expression and long‐term memory in adult central nervous system" for further consideration at eLife. Your revised article has been favorably evaluated by a Senior Editor, and a Reviewing Editor. In this revision the authors have provided essential additional data needed to support the findings of this study. In particular, the chromatin immunoprecipitation controls (e.g. the V5 ChIP from nontransduced neurons and the endogenous Satb2 ChIP from hippocampus) provide crucial support for the model of direct transcriptional regulation by Satb2 in hippocampal neurons of the mRNA and miR targets identified as dysregulated in the sequencing studies. Further the validation of the mIR findings by RT-PCR and ChIP-PCR strengthen the focus of the manuscript on these targets. The major finding of this study – that Satb2 has an important gene regulatory function in mature hippocampal neurons relevant to synaptic plasticity and learning and memory – is a novel and useful addition to the literature that will be of interest to a broad range of neurobiologists. That being said, the narrative of the manuscript still overstates the impact of some of the findings and requires further textual revision to fully address the original critiques from the first round of review. 1) The BDNF data remain partially disconnected from the rest of the story and the "synapse to nucleus feedback loop" idea that is repeated several times in the manuscript is not supported by the data. The experiments demonstrating BDNF-dependent regulation of Satb2 expression in cultured neurons are well done, and the authors make a reasonable argument to keep these data in the main figures. However, they do not have relevant evidence for BDNF-dependent regulation of Satb2 in vivo or any evidence that induction of Satb2 expression is required for its role in hippocampal function. (Dark rearing is not a relevant experiment to demonstrate activity- or BDNF-dependent gene regulation in vivo. The more usual experiment would be dark adaption after eye opening followed by light exposure, since dark rearing induces developmental delays.) I do not think it is required that the authors demonstrate BDNF-dependent regulation of Satb2 expression in vivo. However in lieu of these data or other data showing that BDNF- or activity-dependent regulation of Satb2 levels matter for the functions of Satb2 identified in this study, then the authors cannot conclude in the Discussion that they have identified a synapse to nucleus feedback circuit. This language needs to be removed from the last line of the Abstract, the last line of the Introduction, and the first line of the Discussion. It is reasonable based on the BDNF data provided that the authors can speculate in the Discussion that BDNF-dependent regulation of Satb2 might regulate synapse plasticity as they propose. Finally, the Discussion section on the relationship between BDNF and Satb2 in synapse plasticity (third paragraph) remains beyond the data. Lots of things disrupt LTP in the hippocampus in addition to BDNF and Satb2, so just because those two have LTP disruption in common does not bind them tightly together. 2) The authors have improved their commentary on the possibility that Satb2 is acting to regulate mature hippocampal neuronal function via chromatin looping, but several sentences in the Discussion still remain that are overstatements from the data presented. "Our findings suggest that some of the key functions of the hippocampus depend on changes in the higher-order chromatin architecture." The authors' findings suggest these functions "may" depend on chromatin looping. Yes, the literature shows that Satb2 regulates chromatin architecture but it very well is likely to have additional functions. Unless the authors were to study chromatin architecture in these neurons of this mouse, it cannot be concluded that is the mechanism of action in this study. "Our results in primary hippocampal cultures also suggest that this type of higher-order chromatin rearrangement is an activity- and BDNF dependent process that involves changes in Satb2 expression levels." This is speculation since this manuscript provides no evidence for changes in chromatin looping associated with changes in BDNF-induced Satb2 expression. This can be proposed, but the data do not "suggest" this conclusion. "Our findings indicate Satb2 as a regulator of such 3D-chromatin configurations at a genome-wide level. " There is no data at all in this manuscript that is relevant to this statement. It should be removed. Subsection “BDNF and synaptic activity up-regulate Satb2 via the ERK1/2 pathway”, second paragraph: The two fold induction of mRNA expression is statistically significant but not "strong". Subsection “Satb2 occupies active gene promoters”, first paragraph: "suggesting that Satb2 predominantly binds to active promoters of transcription factors and synaptic plasticity genes." It is not clear the authors have the data to support the word "predominantly" which would be quantified as well more than half of the targets are these genes. Unless this fact can be provided the phrase should be cut from the sentence. Subsection “Satb2 occupies active gene promoters”, third paragraph: "our analysis revealed strong association of Satb2 with mIR promoters" The word "strong" is not quantitative. Do the authors have a statistical way to show this is "significant"? Otherwise the observation should just be stated with no qualifier. Subsection “Satb2 determines the expression of protein-coding genes and miRNAs linked to learning and memory in the CA1 hippocampal field”, last paragraph: The word "pivotal" for the role of Satb2 in microRNA regulation is very strong and would suggest it is more important than other mIR regulators. "Important" would be more accurate for the data presented here. Subsection “Re-expression of Satb2 into adult hippocampus rescues both a decrease in Arc protein and fear memory deficits”, first paragraph: "A large group" of microRNAs regulating Arc is a vague term that should be quantified or restated. Discussion, fifth paragraph: The preferential regulation of miRNAs over mRNAs does not "indicate" the presence of Satb2 cofactors that determine selective binding and control of miR promoters – that is just one possible explanation. A) There is no commercially available ChIP-grade antibody against Satb2. B) Our own unpublished data show that Satb2 levels in the adult CA1 hippocampal area are approximately 10-20-fold lower compared to the levels in embryonic or neonatal cortex, where the previously published ChIP assays have been carried out. Despite these substantial technical hurdles we were able to confirm Satb2 binding sites initially revealed by in vitro ChIP-seq experiments in CA1 tissue. In these newly added experiments we used a rabbit polyclonal antibody against Satb2 (offered by Abcam, ad34735) that has been previously used in EMSA assays and in a single study describing ChIPseq of chromatin derived from embryonic cortex (Mutual regulation between Satb2 and Fezf2 promotes subcerebral projection neuron identity in the developing cerebral cortex, McKenna et al., 2015). As a negative control, we used chromatin from Satb2 cKO CA1 tissue. With this Satb2-specific antibody we succeeded in demonstrating Satb2 enrichment at various Satb2 target regions that we had previously identified in our in vitro ChIPseq in chromatin ex vivo samples from control but not Satb2 cKO mice. The results are included in the revised version of the manuscript (Figure 5—figure supplement 4). We also carried out ChIP qPCR assays using AAV-Satb2-V5 transduced and non-transduced primary hippocampal neurons. We performed one ChIP assay using AAV-Satb2-V5 transduced primary neurons (50 million cells) and at least two independent ChIP assays using non- transduced cultures (50 million cells per assay). The experiments in non-transduced cells showed minimal interaction with Satb2 for all tested target regions. The results are included in the revised version (Figure 5—figure supplement 1). Furthermore, we complemented the ChIP qPCR data derived from AAV-Satb2-V5 transduced neurons with a second biological replicate of the ChIP seq experiment (in which libraries for input and pooled ChIP DNA from three independent ChIP assays were used). The results from the second biological replicate completely confirmed the mapped Satb2 genomic binding sites and will be deposited at the GEO. We agree with the reviewers about this point. We have changed the Results and Discussion sections accordingly. New experimental data have been added as required: Figure 6—figure supplement 2 Validation of the differential expression of selected miRNAs by qPCR. Pre-miRNAs were not detected in our RNAseq and sRNAseq experiments. We used the TruSeq RNA v2 kit which relies on polyA selection and on essence precludes the analysis of pre-miRNAs. The sRNAseq protocol we applied also does not allow pre-miRNAs quantification because of size selection during library prep (only fragments with 147-157 bp length including adaptors which correspond to miRNAs (22 bp) and piwi-interacting RNAs or some other regulatory small RNA molecules (about 35 bp) are selected). A potential explanation is added in the Discussion. The use of whole CA1 hippocampal homogenates (e.g. in Western blotting experiments) will dilute the signal when only a small proportion of the cells in the sample are responsible for the changes. Tagging of activated neurons, e.g. in H2B-GFP TetTag mice, has shown that only 10-15% of CA1 pyramidal neurons become activated and labeled during fear conditioning (Reactivation of Neural Ensembles during the Retrieval of Recent and Remote Memory, Taylor et al., 2013). Thus, a special transgenic line should be used (such as H2B-GFP TetTag mice) to permanently tag neurons that are active during contextual fear conditioning and then examine Satb2 levels exclusively in the labeled neurons. To circumvent this issue we used the dark-rearing paradigm to manipulate activity in the visual cortex. Unlike learning paradigms where only a small proportion of neurons are engaged, visual deprivation upon dark rearing causes a more general and robust decrease in activity levels in the visual cortex making it a more suitable model. Dark-rearing of mice for 4 days lead to a significant decrease in Egr1 levels in all layers of visual cortex (Author response image 1A) as previously shown (Differential induction and decay curves of c-fos and zif268 revealed through dual activity maps; Zangenehpour and Chaudhuri, 2002). Similarly, we found a small, but significant reduction in Satb2 levels by dark-rearing (Author response image 1B). This finding demonstrates the possibility of Satb2 regulation by neuronal activity. The small effect size that we observed points to the necessity of more specific measurements in learning paradigms such as determining Satb2 in activity-tagged cells or after mosaic DREADD silencing. In addition, a circumstantial evidence for Satb2 regulating or being regulated by ensemble dynamics is an observation of variability of Satb2 nuclear intensities between cells. It is currently under investigation. We did not include these data in the current manuscript because we consider them beyond the scope of the current investigations focusing on Satb2 function in hippocampus. (A) Mean intensity of Egr1 in each layer was normalized to corresponding layer 4 for each mouse to obtain relative Egr1 expression. Dark-rearing leads to a significant reduction in relative Egr1 levels in layer 2/3 and 6. (B) Dark-rearing leads to a reduction in relative Satb2 levels in layer 2/3 and 6. We also tested the idea of Satb2 regulation being necessary for learning-induced Arc expression by using IHC with tyramide signal amplification after contextual fear conditioning. The experiment compared three groups, naïve animals, 2h and 12h after training for both genotypes with 6 mice per group. Arc intensity was measured in a region of interest within the dorsal CA1-stratum pyramidale. The analysis did not reveal any effect of Satb2 loss on either early or late wave of Arc induction. Here, we would like to point out that intensity measurements by IHC cannot be directly compared to Western blot quantification of Arc protein in the CA1 area since in IHC experiment Arc expression in the cell soma is only considered whereas Western blot measures also Arc in dendrites where Arc mRNA is translated. We have eliminated all reference to a “synapse to nucleus feedback loop” in the Abstract, Introduction and Discussion sections. The discussion of functional interactions between BDNF and Satb2 has been slashed. Although we are convinced of the proposed BDNF and activity-dependent regulation of Satb2 in vivo, we agree that the in vitro data in the present manuscript, although providing strong indications, have been over-interpreted by us. Work concerning Satb2 regulation by dark adaptation/re-exposure to light in V1 (which in fact was what we were referring to in our previous letter) is in progress in our laboratory and we will discuss mechanism of in vivo-Satb2 regulation and its functional connex with BDNF in due time. In addition to eliminating some grammatical errors, we have erased or changed a number of vague terms and expletives throughout the manuscript. We are grateful to P Feurle for excellent technical assistance. We acknowledge N Yannoutsos for ES cell injection. We are grateful to F Ferraguti for support in stereotaxic injections and critical reading of the manuscript. This work was funded by the Austrian Science Fund (FWF grants DK W1206 ‘Signal Processing in Neurons’ to GD and NS; SFB F44 ‘Cell Signaling in Chronic CNS Disorders’ to GA, GD and NS, P25014-B24 to GA), Medical University of Innsbruck (MUI-Start 2010012004 to GA), and the Deutsche Forschungsgemeinschaft (to MK). © 2016, Jaitner et al.